Whether you’re an experienced cyclist or a newbie to riding, every cyclist needs a good track where you can pedal to get your km’s up and get your blood pumping. With this in mind, we have put together our top 10 favourite rides that will have you geared up for #SpringCycleSydney on Sunday, October 14. Ride sunrise to sunset in Sydney’s stunning Centennial Parklands. Enjoy a leisurely 3.5km pavement ride among the trees and surrounding lakes circling Grand Drive. For those that are not experienced cyclists; children and beginner cyclists can practice on the Learners Cycleway, which features an adjacent playground for when the kids get bored of the wheels. If you and the little ones get peckish there are several food and beverage outlets to stop at along the way. Explore Western Sydney on a 50km off-road sealed cycleway. Ideal for experienced riders to first timers, The Prospect Loop connects Guildford and Canley Vale on the Parramatta-Liverpool Rail Trail and reaches as far as Abbotsbury. Along the way you can stop for a bite to eat at Prospect Dam picnic ground but remember to BYO food. It’s the ultimate trail to get those legs moving. 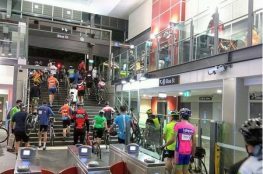 Move away from the hustle and bustle of Sydney’s busiest roads and clock up your kilometres on the 18km track from Parramatta to Olympic Park. This shared path is perfectly designed for all ages and riding abilities, so it’s the ideal excuse for a family funday. Plus it’s perfect practice for the 18km River Ride! Make sure you grab a bite to eat and explore all Olympic Park has to offer before jumping back on the bike back to Parramatta. Ride one of Sydney’s oldest and most popular shared paths. 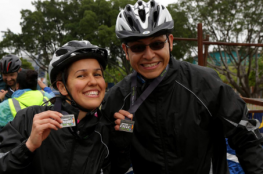 The 23km ride starts at Settlers Park in Ryde, meander through Gough Whitlam Park, following the gorgeous Cooks River most of the way and finish at peaceful Botany Bay. Various town centres, railway stations and parks are en route, so you can make a day of it, stopping for coffee, lunch and snacks as you go. Perfect for a family day out! The Bay Run is one of Sydney’s most popular harbourside shared paths and for a good reason. The flat 7km pavement track follows the Iron Cove foreshore through Rozelle, Lilyfield and Drummoyne, never deviating more than 20m from the water. The Bay Run is an enclosed shared path for cyclist and pedestrians, so you can start and finish at any point and it’s perfect for riders of all abilities and ages. As a busy running track keep an eye out for pedestrians as you ride. Post cycle, treat yourself at one of the several cafes with a big breakfast feast and a cup (or two) of coffee! Grab your mountain bikes and hit the 8.4km Narrabeen Lagoon Trail for the perfect weekend ride. Immerse yourselves in the history, wildlife and cultural heritage of the area as you pedal away. Don’t forget to stop along the way to take in the natural beauty of the lake and capture a quick #Insta snap while you’re at it. This flat dirt track is great for the little ones to see what their mountain bikes are made of off road. Do you want an uninterrupted, traffic light free 40km stretch through Western Sydney Bushlands? Then check out the off road cycleway next to the M7. Get your blood pumping and those kilometres up with over 60 entry and exit points which line the route from Glenwood in the North to Prestons in the South. This cycle track attracts approximately 300 riders on a weekday and 1000 plus on weekends. Get your piece of the action! Tip: Make sure you pack enough water on this ride. There is only one spot to fill up over this 40km ride. Want to mix it up with off- and on-road riding while enjoying a view? Cycle along the Botany Bay coast, on the shared pathway at Brighton-le-Sands and down to Cronulla on the on-road cyclepath. Take a well deserved break to refuel then head down Captain Cook Drive to Kurnell and up into the National Park to the whale lookout point. All in all this is a good and easy weekend ride so take your time on the bike and break up your day with a beer and pub lunch half way through. Get those gears going on a 60km on-road cycle on a strenuous but rewarding trek through Galston Gorge, Berowra Waters and Bobbin Head. There may be more than 1km of vertical climbing and stomach-dropping hairpin turns, but the sweeping views of the Hawkesbury River and Ku-ring-gai’s rolling hills are hard to beat. The whole ride may take more than four hours to complete, so be prepared with water and food. Seeking a challenge? Then look no further than the Royal National Park! With three on-road scenic trails at your disposal you can be sure to put yourself and your bike to the test. • Lake Carrington Drive – The 9.6km two metre wide track is recommended for supervised children and family groups. It’s also for those seeking a chance to encounter an echidna or lyrebird. • East Heathcote Trails – Try your hand at a variety of loops on the East Heathcote Trail. The terrain is generally flat although some steep sections are encountered at creek crossings. • Loftus and Grays Point Trail – Comprises some 8km of fire trail and 2km of single track accessible from a variety of locations. Terrain varies from flat, wide open trails, to steep rocky fire trails to medium grade single tracks. WARNING: Steep sections of fire trails are not recommended for inexperienced riders. • Don’t have a mountain bike but want to experience the Royal National Park? There is some great riding on-road for the more experienced riders. Enter the park at Loftus (Farnell Ave) and follow the road. It will take you up Audley Road (steep hill) and all the way down into the park. You can then choose to go up the hill towards Waterfall and back on the Princess Highway or continue up to the Stanwell Tops lookout. Loftus entry to Waterfall or Stanwell Tops is both approximately a 27km ride with some challenging hills.